Today I found out about Sergeant Stubby, the most decorated war dog of WWI. When he was a puppy in 1917, Stubby was wandering around the fields of Yale University. Private Robert J. Conroy was undergoing military training in the area at the time, and found the little dog with a short tail who he decided to name Stubby. Conroy brought Stubby back to camp, and although pets were not allowed, Stubby proved good for the soldiers’ morale and was able to stay. While living with the soldiers, clever young Stubby trained as well. He learned how to salute with his paw and became familiar with bugle calls and marching routines. Several of his soldier friends undoubtedly thought these things merited taking Stubby off to war with them when the time came. He had become something of a mascot for the 102nd Infantry Battalion. Dogs were not an uncommon sight during the war, but the United States Army didn’t employ many of them—they were used more often by the Europeans. At the least, Conroy obviously thought the dog had earned an honorary position, because he smuggled Stubby on to the ship, breaking some rules in the process. Once on board, he hid Stubby in a coal bin until the ship was out to sea. When Stubby emerged, most of the soldiers were ecstatic. However, when the commanding officer discovered the dog, he was less than pleased. Perhaps sensing he was in trouble, Stubby gave the CO a salute, which impressed the CO so much that he allowed Stubby to stay on. The 102nd division would later be grateful for the addition of Stubby to their lines, as you’ll soon see. The 102nd reached the front lines in France on February 5, 1918. They were under constant fire, and Stubby became used to the gunshots and explosions that were now part of his everyday life. 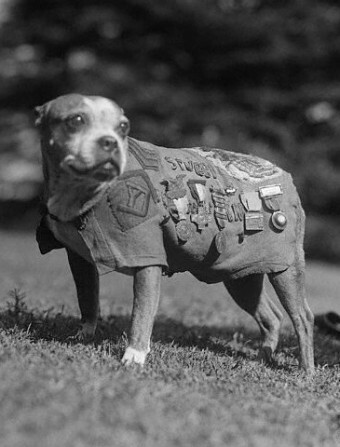 All too soon, Stubby sustained his first injury: inhaling toxic gas landed Stubby in the hospital, where he was treated alongside his two-legged comrades. He made a full recover, but the encounter with the dangerous gas left Stubby sensitive to the smell. This came in very useful during a German gas attack a while later, which happened in the morning while most of the soldiers were asleep. When Stubby smelled the offending gas, he started barking and roused most of the soldiers before they inhaled too much, saving many lives. It wasn’t just his nose that helped the soldiers out; his ears did, too. Stubby was able to dart between the trenches of the opposing armies and find wounded soldiers. He was also trained to differentiate between English and German speakers, and learned to bark at the location of wounded English speaking soldiers until paramedics arrived to care for them. Stubby also was trained to whine when he heard incoming artillery shells, which alerted his fellow soldiers before human ears could pick up the sound. In one incident, Stubby captured a German spy. The man was mapping out the Allied trenches when he spotted Stubby and called out to him in German. Stubby, recognizing it as the language of the enemy, charged the man down and attacked him, keeping him in one place until United States soldiers arrived to cart the new prisoner off. Stubby was promoted to the rank of sergeant for capturing this spy, becoming the first dog to achieve such a rank in the United States Army—not to mention surpassing his owner’s rank (now a corporal) in the process! However, Stubby didn’t escape the war unscathed. In addition to the gas incident, Stubby was wounded at least once, coming away from a battle with shrapnel imbedded in his chest and legs. He was rushed to the hospital and had to undergo surgery, but ended up making a full recovery. While he convalesced, he visited with soldiers in the hospital, boosting morale. All in all, Stubby served in 17 battles during the war. He had to be smuggled back home—dogs still weren’t allowed on the ship—but when he landed on American soil he was an instant celebrity. He had served faithfully in the war, saving many lives and earning nearly a dozen medals for various deeds. He met President Woodrow Wilson, visited the White House twice, and led several military parades. After a while, Conroy and Stubby settled down at Georgetown, where Conroy studied law. Stubby was made the mascot for the Georgetown football team. During halftime of the games, he would wander the field nudging the football around and entertaining the fans, one of the first halftime shows in history. In 1926, at the age of 9 or 10, Stubby passed away. His body was donated to the Smithsonian Institute where it was preserved and put on display, along with his medals. They did a thing on this dog in Monumental Mysteries (Mysteries at the Museum???)! This dog was a Boston Terrier, also known as a Boston Bull Terrier or “Round Head”..You wouldn’t know it because the standards for a pedigree have changed significantly. Boston are more terrier like than the old days.